The 190 SL was made not only to fill the gap in Daimler-Benz's product range but also to express the elegance hindered in the 300 SL's muscular outlook. Since its inception, the engineers worked lightning fast to develop the M120 motor into a 1.9lt unit, upgrade the basic 4 speed gearbox and design the rear single-joint axle to meet the 1954 New York International Motor Sports show deadline. However, none of these would matter unless the mesmerizing body was sculptured by Mercedes-Benz designers, Hacker, Ebnet and Gunther. 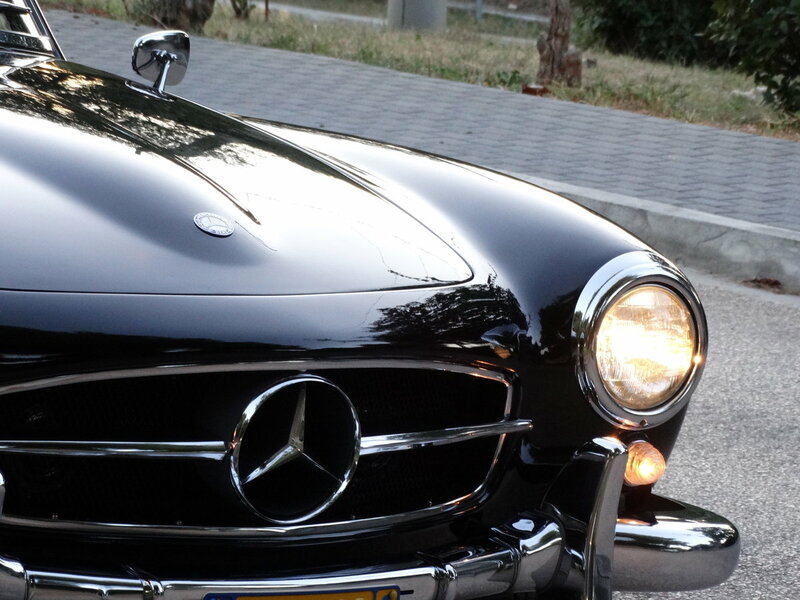 Throughout its production, the 190 SL received numerous engineering upgrades. In contrast, the design of the body and interior remained untouched. 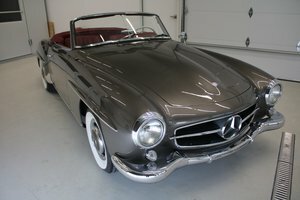 With a price tag of over 16000 DM, it was offered in 2 basic versions; the limited-equipped 121.042 roadster with MB Tex and soft top, and the more luxurious 121.040 coupe featuring additional chrome molding, leather seats and a hard top with small rear window. For select customers, there was a 3rd version also designated as 121.040 that combined all benefits of the roadster and the coupe versions featuring a hard top with panoramic rear glass, a built-in soft top compartment and a soft top. 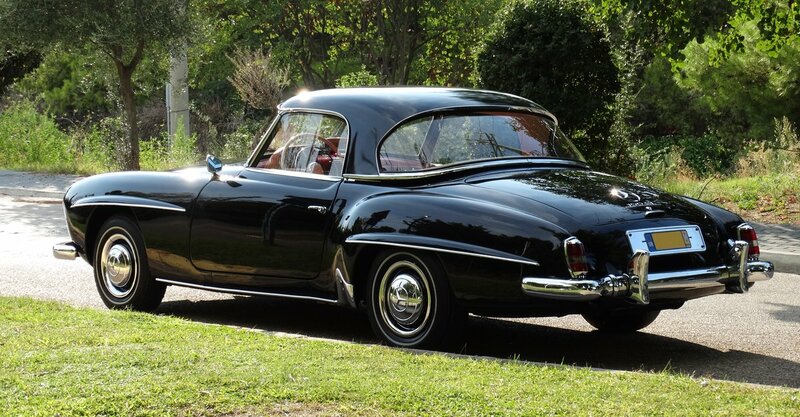 This special version was the most luxurious and expensive at 17650 DM and set the pedestal for all 190 SLs produced. 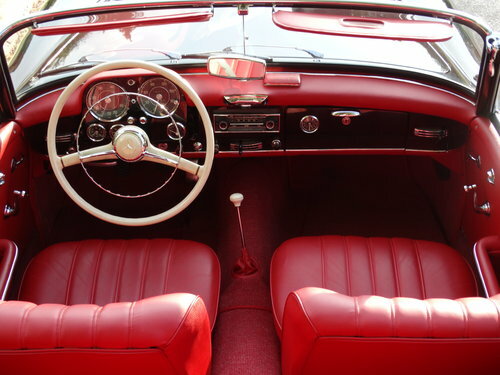 The 190 SL offered here was manufactured as such in the spring of 1961 bearing its panoramic hard top and soft top. Being late in the series, it benefits from all production upgrades prior to the unfavorable fitting of the lower compression 121.981 engine. 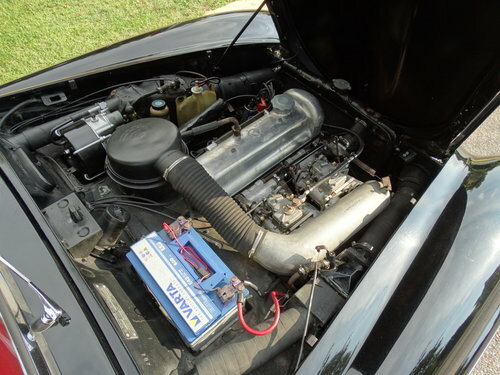 These provide for an enhanced acceleration with shortened 3-gear and rear axle ratios, a better feeling of control with tighter throttle linkages, booster valve braking and increased brake ventilation clearance, as well as an increased safety with polyethylene heating levers and a trunk handle instead of a hook. After 4 decades in the most caring of hands, its owner decided to restore it. Unlike most 190 SLs in recent years’ market, this was not restored by a dealer with a resale value in mind but a loving owner who opted for perfection. 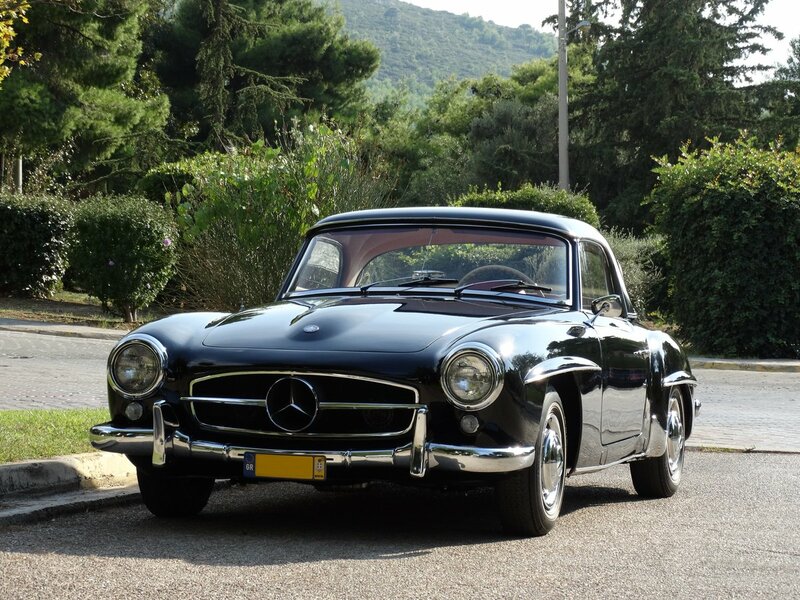 His efforts were rewarded soon after as the 190 SL won 1st Place at 1997 Mercedes Benz Club of America, Sea-Level Section, Concours d' Elegance and 2nd Place at 1999 Mercedes Benz Club of America, Sea-Level Section, Southampton Concours. 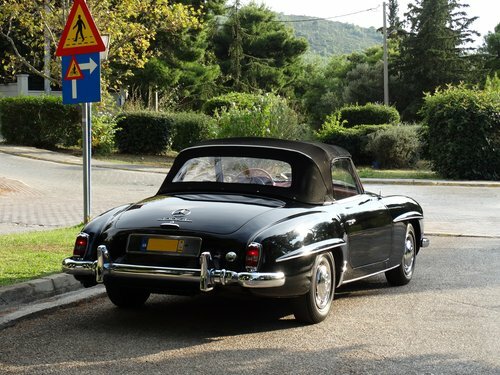 In 2006 the 190 SL eventually changed hands and in 2008 it was imported in Athens, Greece to become part of a private indoor collection. Aside from a separate display room, the 190 SL received a no-expense spared maintenance that included replacing all consumables in the transmission, front axle and suspension as well as timely engine servicing. As expected, the body and interior remained untouched. 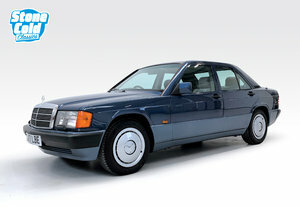 It is now offered in perfect running and cosmetic condition with original tools, manuals and awards. - Steering and suspension overhauled with new links, rods, mounts and bushings fitted.